Richard Branson was in London today to announce "one of the most exciting developments of our lifetime." Right, so that'd be SpaceShipFour, we presume, capable of landing on the moon? No, not quite, but a low-carbon fuel would definitely be our second guess. Virgin Atlantic is partnering with LanzaTech, a company that specializes in carbon re-use technology, to recycle waste gasses from 65 percent of the world's steel mills. In Branson's own words, they'll be "taking much of the s**t from up the chimney stacks and turning it into aviation fuel." By capturing those gases that would otherwise be released into the atmosphere, Virgin would be able to reduce its overall carbon footprint without necessarily reducing the carbon output of its individual aircraft. The airline plans to have the fuel ready for commercial use by 2014, and will begin trials on its routes from London to Shanghai and Delhi around that time -- two cities that have become synonymous with pollution. Jump past the break for an audio-less demonstration video -- that's right, there's nothing wrong with your speakers. 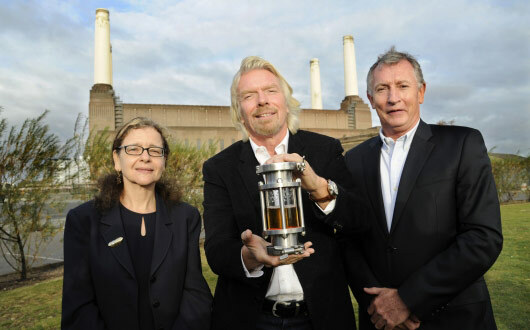 Virgin Atlantic launches low-carbon fuel, aims to halve carbon footprint (video) originally appeared on Engadget on Tue, 11 Oct 2011 17:31:00 EDT. Please see our terms for use of feeds.